The Illinois prison population has doubled in the last twenty-five years, mostly due to the “war on drugs,” and incarceration rates tend to be concentrated in high-poverty communities, like those that populate Chicago schools. CPS does not have enough social workers or counselors to help students get vital services that can stave off some of the negative consequences of the emotional stress of having an incarcerated parent. Many students end up at grandparents’ houses and have to change schools, adding to the stress and trauma. We cannot know exactly how many CPS children have incarcerated parents at any point during the year because there is no policy or procedure for reporting a parent’s incarceration. In the 1990s, CPS employees could look in the state’s public database if they suspected a family member might be incarcerated, but the CPS internet firewall does not currently allow access to that database. In most cases, social workers or other school staff do not know about this intense stressor until a student acts out. 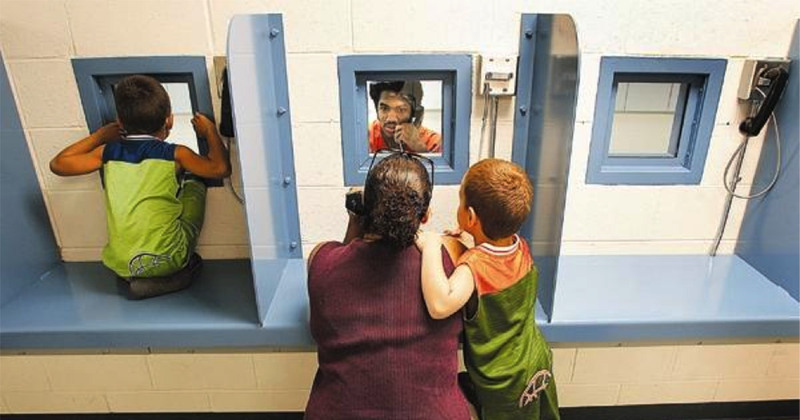 In 2007, Catalyst Chicago published an in-depth exposé on children of incarcerated parents and they added some updates online in 2009. The magazine surveyed CTU social workers and about half (21 respondents) reported that at least 10 percent of their students had an incarcerated parent, while five respondents reported that one-third ­to one-half of their students had a parent in jail. The citywide estimates are two percent of all students and four percent of African-American students. The trauma of being separated from a parent, along with a lack of sympathy or support from others, can increase children’s mental health issues, such as depression and anxiety, and hamper educational achievement. Five of the schools profiled in the Catalyst Chicago research have been closed since the publication. According to Catalyst Chicago , many students with parents in prison drop out of school and 70 percent end up in prison themselves, eventually. The magazine pointed out, however, that mentoring programs are shown to have a huge positive impact on such children, both academically and behaviorally. While there are several nonprofit organizations around the city that provide counseling, mentoring and parent visit services, there is not enough money and more help is needed. In January 2016, due to budget cuts, the state eliminated a monthly bus ride for children to visit their moms in the Logan and Decatur correctional facilities. Three organizations (Cabrini Green Legal Aid, Moms United Against Violence and Incarceration, and Nehemiah Trinity Rising) partnered up to raise money to buy vans so children and mothers can continue to visit each other, which research has shown is vitally important for families. Click here to make a donation. Considering that students are in school more often than not, CPS can do a lot more by ensuring that every school has a social worker on staff, providing training for school staff to understand how to be sensitive and empathetic to the needs of the students, and helping schools connect with social service agencies. “Children [of incarcerated parents] are angry, feel abandoned and distrust authority,” Catalyst Chicago noted as part of its analysis of needed support services for the students. Yet, because CPS does not value the important role school counselors and social workers are supposed to play in public schools, very few children in CPS have access to mental health services. Too often, school counselors are busy with case management and social workers are scrambling just to comply with the Individualized Education Plans that mandate special education services. In the May 2016 Chicago Union Teacher , CTU counselor Katie Shoemaker reports that an astonishing “32.5 percent of CPS students felt sad or hopeless almost every day for two weeks or more” in the 2013 school year and 15.5 percent attempted suicide. Just living in a neighborhood with a high incarceration rate increases residents’ chances of suffering from depression and anxiety. Even for residents who have had no contact with the criminal justice system, heightened police vigilance can cast a shadow over their children, families and homes. While CPS might not have access to the data on absolute numbers of students affected by incarceration, they do know that the prevalence is concentrated in a few high-poverty communities. The district needs to commit to fully fund clinical services in all CPS schools but it could certainly begin with the schools most urgently in need. incarceration, poverty, school counselors, school-to-prison pipeline, social workers, state budget. Bookmark.